Does anyone have brain re-forming tips? Because my brain has turned into a pile of mush and I kind of need it to be functional instead of mushy. Last week was my first full week here, and that meant finally getting down to business and figuring out what needs to get done for this building project. Part of me wishes that I was still in a state of blissful ignorance, but that ship has sailed. This project is going to be A LOT of work, and in order to do my part, I’m going to need to learn very quickly. To give you a mini-rundown of the project, it’s a relatively small 3-story building. On the first (ground) floor, there’s a bathroom that’s existing, and we’re adding two classrooms, one on either side. 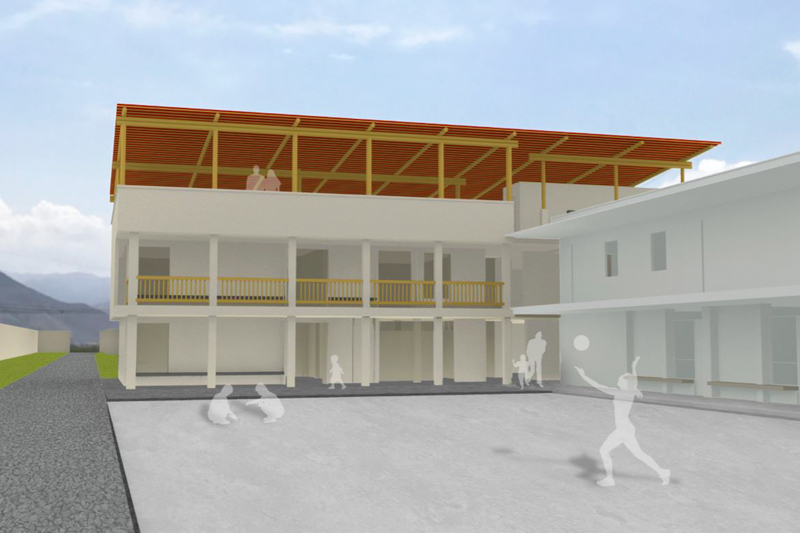 On the second floor, there will be three classrooms, and on the top “floor” (it’s being called a “half floor” because it won’t have full-height walls), there will be a multipurpose space and a kitchen. Here’s the general plan of the ground floor. 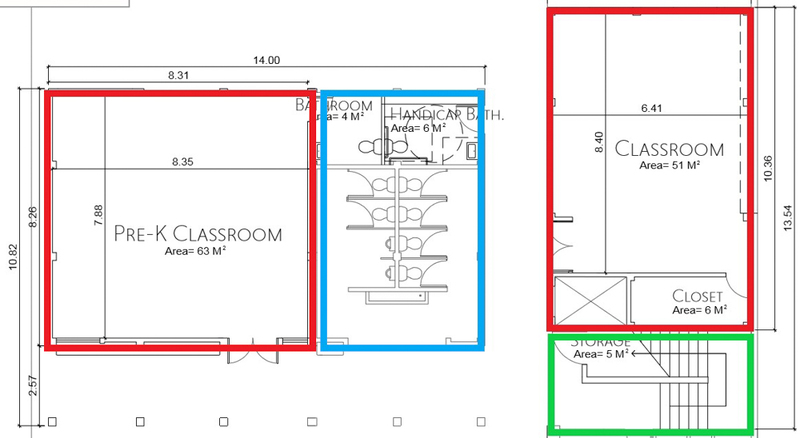 The two red boxes are classrooms, the blue is the existing bathroom, and the green is the stairs. On the second floor, there’s no big bathroom, and there are 3 classrooms instead. This is one of the renderings from the EA informational booklet about the project, showing what the finished building will look like (kind of). The building to the right is existing, plus the bathroom which is in the middle of the ground floor in the building straight ahead. The rest will be all new! 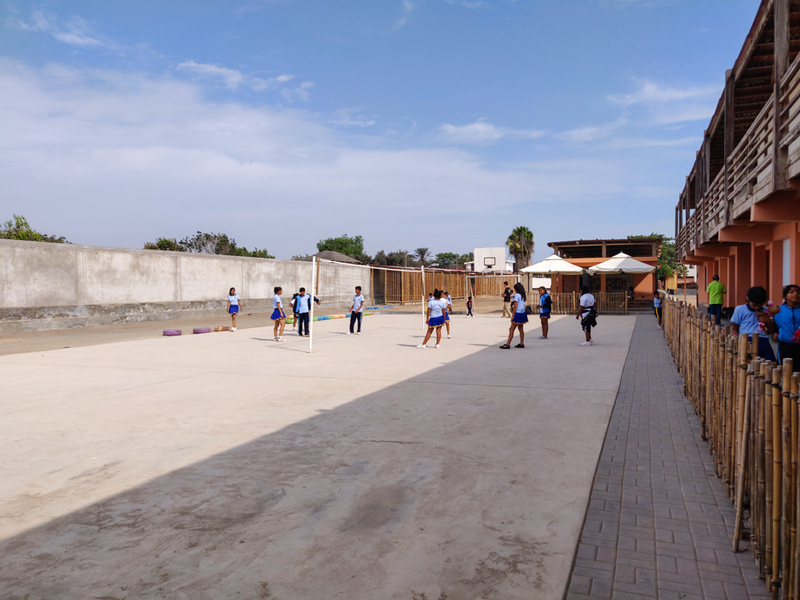 Volleyball game on the “soccer court” at recess. The new building will be straight ahead (the bathroom is behind those little white tents). Thankfully, I don’t need to worry about any large equipment or electrical panels. That infrastructure already exists, so we’ll be able to simply connect the new into the existing system. The major “uh oh” factor is coming from the realization that even though I did have a relevant job for a couple of years, the things I did were only a small portion of what’s needed for a full design. And, to make things even worse, I don’t know anything about what products are available here or Peruvian design rules-of-thumb. Debbie lent me her code book which is great… but of course, it’s in Spanish. I can understand it well enough, but it’s just one more thing on the list of tasks that are going to take a liiiiittle bit longer than they would at home. Add all of the “littles” together, and I have a lot of work to do. 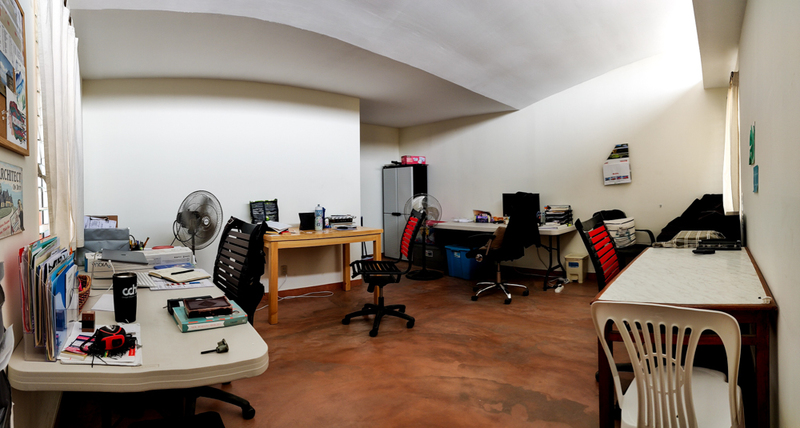 Here’s an awkward panoramic view of the office. We have 5 people sharing the space which is an adventure! My desk is the wooden one straight ahead. This is where the magic and hair-ripping happen. Most of last week was spent on the world’s most tedious task… formatting. You don’t have to know anything about architecture or engineering to know that formatting documents is the worst. In this case, it’s the necessary prep work that will make the actual work go smoothly, but I feel like I accomplished next to nothing because there’s no physical result from my work. It’s also relatively mind-numbing. By the end of the day on Friday, I felt like my brain was made of mush (and it felt like it was functioning about that well, too). The one positive is that I mostly finished, so this week I can get on with doing actual work! Instead of having a restful weekend, Debbie decided that we should go on an outing on Saturday. To an architecture seminar. On urban acoustics. In Spanish. She wanted me to meet her architect friends, and I’ll admit, I’m happy that we went. It was fun and the people were cool, but I would absolutely not describe it as a restful day. The morning involved about four hours of attempting to follow acoustics-related Spanish (which thankfully isn’t terribly different from acoustics-related English) and straining to remember the things I learned seven years ago (eek!) in my university acoustics class. Ha. The topic was interesting though. The presenter just returned from a year studying in Spain, and he presented foundational acoustics information, plus his thesis topic. Side note, I was the only engineer in a room of architects, and that interaction is apparently the same no matter what country you’re in. Any time math was involved, I was basically called out with a, “but you already know this, don’t you?” I mean, no, not necessarily, but I do know how to use a calculator so I can figure it out..? Ugh. Architects. (I’m kidding, I’m kidding.) ANYWAY, his thesis looked at different road geometries (like raised roadways vs. sunken roadways vs. roads with walls, etc.) and analyzed how well the various configurations controlled the noise from the traffic. There was also a practical portion in the afternoon where we took sound measurements at various locations along a nearby street. It was fun! It reminded me of university because architecture/engineering students are always doing weird things in public for their classes. Buses kept stopping and trying to give us a ride because it absolutely looked like we were waiting for something. By the end of the day, I was exhausted, and my brain was even more like mush than the day before. So yeah, probably not the best strategy for a brain revival, but good nonetheless. 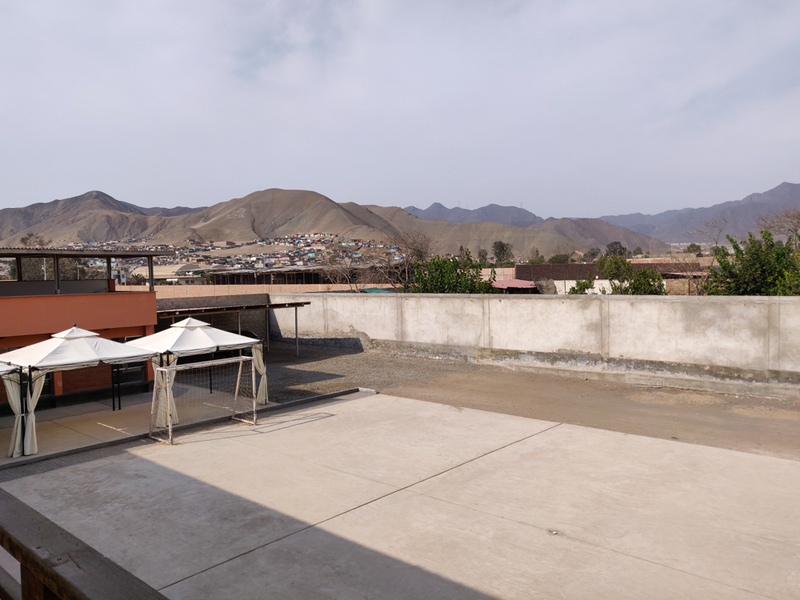 View of the mountains from outside of the office. Aside from work and my mushy brain, I’ve just been trying to keep myself sane. I’ve been attempting to work out on weekday mornings… I feel like I should at least do SOMETHING to offset the fact that I spend the rest of the day hunched over my computer screen, slowly pulling my hair out. On one final note, if you’re wondering why you have yet to hear about Patagonia, it’s because of the internet. And also me. And mostly the interaction between me and the internet. Long story short (and vague), I decided I needed to change some big things about how my blog is set up to better suit the complicated disaster that it’s grown into… which meant that I needed to learn things about how the internet works. Which is something that my brain refuses to understand. BUT we survived (both me and my brain), and I think I kind of maybe sort of figured out the things that I needed to figure. I know, I’m oozing with confidence. In conclusion, ignore anything that doesn’t look quite right about my blog page because it’s a big ‘ole work in progress (but if you find something that doesn’t work, please tell me and then ignore it), and fear not. Soon enough, I’ll be confusing the heck out of you by talking about Peru and Patagonia at the same time.